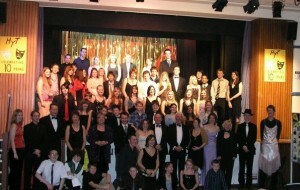 So we come to the end of another successful production with a sold out run at Huntingdon Town Hall. We thank everyone for their support over the last week especially Doug McIlwain who handled most of the organisation of the event and his team who cared for our audiences. Still, there is no rest for the wicked (witches or otherwise) and we move straight into our next production which is a performance of “The Mad Hatters Tea Party” which we will put on at the Holiday Inn, Huntingdon Racecourse on Saturday the 9th May. It is a one time only production so don’t miss out! For tickets visit Marilyn in Huntingdon Town Hall and she will make sure you’re there! The guests who were able to join us for the special occasion. Last weekend we were proud to be able to celebrate a big landmark in our history. 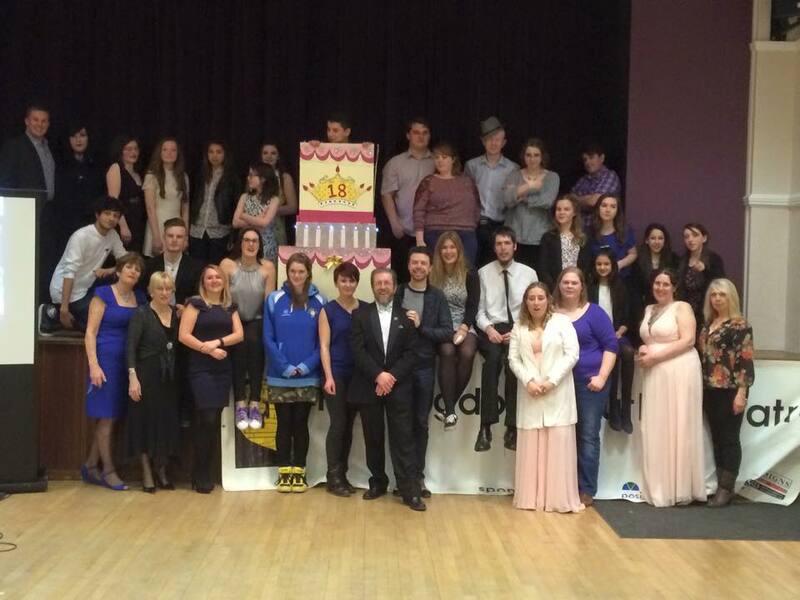 Our 18th Birthday! When we launched, who knew how long it would last but when the doors opened and around 80 young adults came in the group got off the ground and has grown both in name and reputation as well as total membership of over 300 people! Last weekend we invited people from across the years to come back to us and despite members currently living all over the world we were happy to welcome them back, including three founder members who were shocked to find themselves on the wall of honour and looking back at the photographs of themselves taken on that first meeting! We thank everyone who came back to join us for the evening, as well as those who couldn’t make it but were with us in spirit and sent us well wishes. We wouldn’t have reached this part of our history without all of you and the memories we all have and share of our times with Huntingdon Youth Theatre. Thank you for everything and while our current group are working hard on our March and May productions, we look forward to future reunions and building more of those memories in the years to follow! First of all we’d love to wish everyone a happy, prosperous and exciting new year and thank everyone again for all your support in 2014. Our year of entertainment starts early this year, as this month we will be celebrating our 18th birthday with a big party and invites have gone out to members and friends of HYT who have played a part in our history to join us. Obviously it’s hard for us to make direct contact with everyone with members moving all over the country – and abroad! – so we hope people are able to spread the word to their old friends. Get in touch with us and let us know if you’re able to make it. Best way to do so is to contact us via our Facebook page, replying to this post or contacting us via one of the methods listed elsewhere on the website. We’re sure this will be a wonderful way to start the year and prepare for the next 18! Our first production this year is going to be “The Witches of Warboys”, we’ll be returning to Huntingdon Town Hall and court room to recreate the events leading to the trial and this court case that shook 16th century England. Last year our recreation of the Trial of Joshua Slade was a success and we hope to repeat that this year with another slice of local history bought to life for our modern audiences. 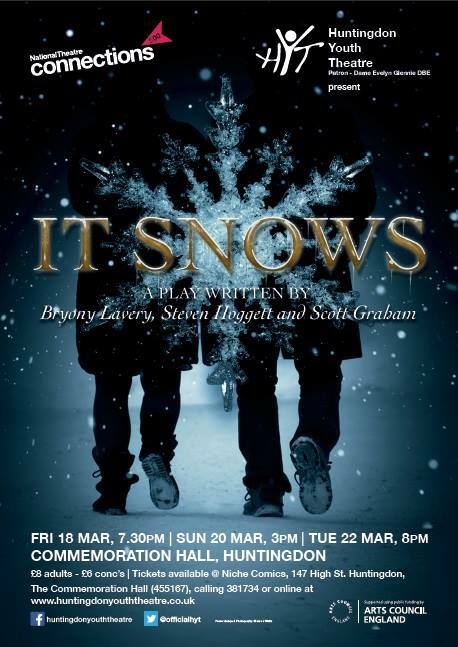 The production will be in March so watch this space for ticket details. Our winter production will be Dracula, our final production will be bringing a version of Bram Stokers classic to life with humour and horror in equal measure. Follow Van Helsing, Mina, and Harker as they pursue the Transylvanian Terror across Europe and to the final showdown in the Carpathians for this Gothic classic. Of course, that won’t be all. We’ll continue to put on various one act productions and workshop pieces so watch this space – and follow us on Facebook – to keep up to date with all our events on this big year! As we have our final curtain call of Sleeping Beauty we finish a very good 2014 for HYT. In March we were fortunate to be offered the chance to recreate a Georgian court case, The Trial of Joshua Slade, in the actual room where the case was heard nearly 200 years ago. To add to that we were joined by a relation of Joshuas’ brother, one of the other potential suspects in the crime! In the summer we ran through an adaptation of Tolkiens’ classic “The Lord of the Rings” and completed the show in a run time of around 45 minutes, Tolkien had taken over 1000 pages, we did it in just 15! Then we’ve finished the year with the traditional pantomime, Sleeping Beauty, giving Nicole Matthews her first chance at directing a major production, a chance she took with relish and was performed by a great group of young actors, many of whom were making their first appearance with us! 2015 is already shaping up to be a great year, in March we return to the town hall for another court case, this year we’re going to be looking into the infamous Witches of Warboys. Another well known piece of local history and folklore coming to life. We’ll be finishing the year with a production of Dracula, a mix of horror and comedy as the winter nights grow short we look forward to bringing the story of Bram Stokers classic to audiences. Watch this space though as there’s sure to be more news as the year goes on! 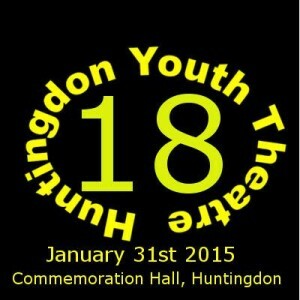 Off the stage in 2015 we’re going to be celebrating a landmark as Huntingdon Youth Theatre come of age and turn 18. On the 31st of January we’re having a big party and hoping to try and see many members over the years come back to join us for one night only. It’s sure to be a great night and we can’t wait! We’re back on January the 6th so if there are any potential new members – get in touch with us over the christmas period, we look forward to meeting you and moving forward over the next few years! This January we will be celebrating the dawn of our 18th year and hope to do so by inviting members past and present to join us for a reunion to celebrate the group coming of age! With members now living all over the UK – and abroad! – we hope as many of them are able to join us on the 31st January as possible. If you’re able to join us or want more details visit our Facebook page or contact the site admin. We hope you can join us on this special day! Huntingdon Youth Theatre are always open for new members! If you, or somebody you know is secondary school aged and has a slight interest in drama then we’re always happy to welcome them in to the group. It doesn’t matter if you’ve done any acting before as we welcome people of all levels of experience and ability and are about trying to help young adults develop their skills and confidence through workshops and performing pieces of theatre. Over the years since our founding we’ve performed many different types of production, from gothic horror and period dramas through to musicals and farce. We’ve had the opportunities to perform overseas and with the Royal Shakespeare Company as well as allowing our members to write and direct their own pieces of theatre and get involved in any way they want from the technical side to costume design. Anything you want to try, our team of leaders always try to support you and encourage you to try new things. Whether we’re in rehearsals for a production or running workshops, get in touch, people are always welcome with HYT!